Welcome to CherokeeVillageForum.com - You do not need to register as a member to post on this forum. Registering is quick and easy, and gives members a few added benefits, however it is not a requirement for posting, replying, or viewing any post in this forum. Your participation is what makes this forum a wealth of information about this area of Arkansas we all love. Enjoy! Check here for any updates and changes to this forum. Please reserve this area for moderator posting only, however replies are always welcome. Thank you. Any general questions or comments about Cherokee Village, Arkansas? If you can't find a relevant place to post your question or comment, just post it here. Are you planning to come visit Cherokee Village, Arkansas? Get helpful information on where to stay and what to do. For people who currently live in Cherokee Village, Arkansas, or for someone who wants to post a question to somebody who lives in the village full-time, this is the spot for you. This is the place where property owners can go to discuss anything pertaining to their lots and/or improved properties inside Cherokee Village, Arkansas. This is where to go to learn more about the history of Cherokee Village Arkansas and the people who made it what it is today, and to also highlight and honor some of our current residents who continue to help make Cherokee Village a better place. 7 beautiful lakes. Lake Aztec, Lake Chanute, Lake Cherokee, Lake Navajo, Lake Omaha, Lake Sequoyah, and Lake Thunderbird. Let's talk Golf! Two 18 hole golf courses in Cherokee Village. The North Course and the South Course. Schools in the Cherokee Village Arkansas area. Churches in the Cherokee Village Arkansas area. If you have a favorite restaurant in the Cherokee Village Arkansas area, please tell us what makes it so special. Is there a type of restaurant you would like to see come to the area, let us know. This can include any restaurant in Sharp County, Fulton County, Cherokee Village, Ash Flat, Highland, and Hardy. Have you received excellent service from a local business in the Cherokee Village Arkansas area that went above and beyond? Please share with us what your favorite store or business is, and why you like their products and services. Is there a type of business you would like to see come to the area, let us know. This can be about any business in Sharp County, Fulton County, Cherokee Village, Ash Flat, Highland, and Hardy. Local businesses in Cherokee Village Arkansas, Sharp County Arkansas, and Fulton County Arkansas, feel free to post a free ad about your business. As always, please support our local businesses whenever possible. Local businesses in Cherokee Village Arkansas, Sharp County Arkansas, and Fulton County Arkansas, feel free to post a help wanted ad for your business here. List your local club or organization information here. Post your community announcements here. Discuss current issues/current events that pertain to Cherokee Village Arkansas and the local communities in Sharp and Fulton Counties. If there's a local issue, event, or concern you want to discuss, start the discussion here. Post relevant news stories that are important to the Cherokee Village, Ash Flat, Hardy, Highland, Sharp County, or Fulton County areas of Arkansas. 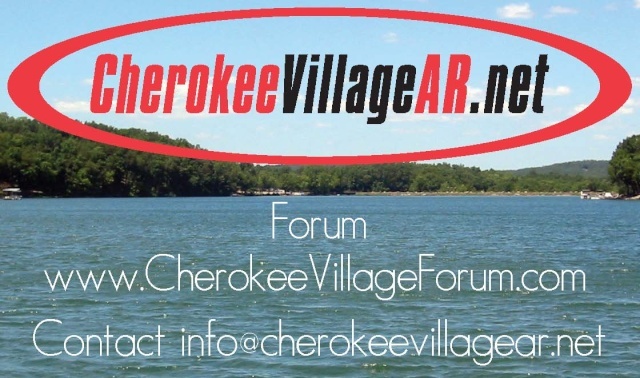 Cast your vote on issues of the day pertaining to Cherokee Village Arkansas and the surrounding Spring River area of the Arkansas Ozarks. Any questions or comments about the State of Arkansas in general, post them here. Local politics discussion area for Cherokee Village, Ash Flat, Hardy, Highland, and Sharp and Fulton Counties. Please keep the discussion civil as we debate the local political issues of the day and upcoming local elections. State politics discussion area relating to Arkansas state politics. Please keep the discussion civil as we debate the state's political issues of the day and upcoming state elections. National politics discussion area relating to National politics. Please keep the discussion civil as we debate the national political issues of the day and upcoming national elections. Do you have something to sell? Are you looking for something? Are you having a yard sale? Post it all here. Organized by category. For those seeking information on anything pertaining to the subject of genealogy and researching their family history. Connect with other users about your family history and specific surnames in Arkansas. You never know who may be reading your post. Lost a pet in Cherokee Village Arkansas? Found someone's lost pet? Also, any general lost and found items in Cherokee Village Arkansas, Sharp County, and Fulton County, this is the place to post it.